I was travelling to New York with my mom to see my sister. I had been to her house once before, but I had printed MapQuest directions that took me through a roller coaster of back roads that made no sense. This time, I was going to use my Garmin GPS. I hardly use it. I am a man. I KNOW where I am going. I also don’t travel much. 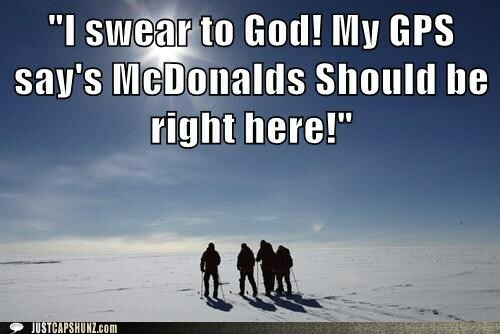 I can find my office, the surgical center, and McDonald’s without the help of 21st century technology. Now my mom has made this trip multiple times–even having driven it herself for years before ministrokes and poor reflexes led to her losing her license. As we passed Tyrone, she points. First of all, even if it was, pointing to it after we have passed the exit isn’t helpful. And secondly, it was not the exit we wanted. She was off by one. Close but no cigar. 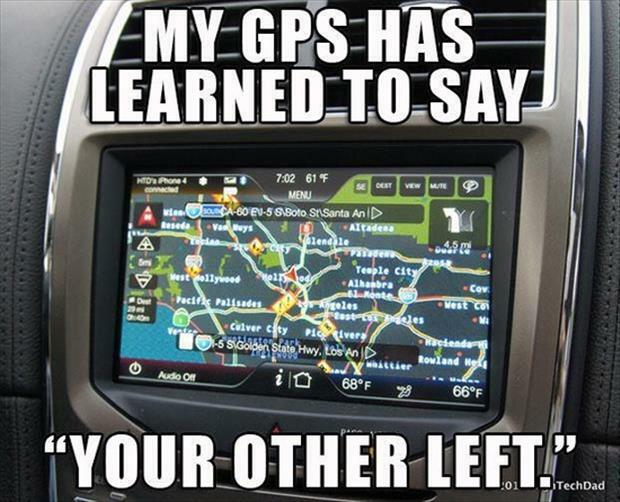 Now because I don’t use my GPS very often, I actually had to spend a fair amount of time to find it. The charge was dead so I recharged it. Unfortunately, I couldn’t find the car charger that plugs into the lighter so I would have to depend on a fully charged unit lasting me 3 hours. I didn’t look all that hard figuring it would last a three hour tour with Gilligan, mom and the doctor too, and I had more important things to do before I left like watching Penn State lose to Temple for the first time in 74 years. The GPS died just as we entered Bradford, PA. My sister lives across the border. We are probably twenty minutes or less from her house. But this is the most critical 20 minutes of the whole trip–it is the final set of turns and roads that I am not familiar with. If I had known the battery wouldn’t last, I would have waited till I got here to turn it on. If I knew Penn State was going to play like crap, I would have left three hours earlier. The damned GPS would still have died, but at least it wouldn’t be dark out. I pulled off to the side of the road. I was going to throw a Hail Mary. I was hoping the cord to connect it to the cigarette lighter was in the glove box. I was pretty sure it wasn’t but I was desperate. I didn’t even have the bad directions from MapQuest. “I know how to get there,” my mom insists. This from the woman who would have had me get off the wrong exit two and a half hours ago if she had pointed sooner and I was an idiot that didn’t know where I was going. I don’t know where I am going right now, and I can’t find the car charger. Kettle meet pot. I am an idiot. So at 10:30 at night, on a remote stretch of highway, I am going to let my 78 year old mom guide me. So I cautiously get back on the road thinking we are never going to get there. Maybe I should just call my sister and have her give directions. With my luck, the phone would die. And that option would entail me having to give her meaningful landmarks of where we were (um, it’s a dark road, with some dark trees, does that help?) and hoping that she could guide us in for a safe landing. She’s had benign brain tumors–three craniotomies, two gamma knives and a radiation treatment in a pear tree. I should have taken that left turn at Albuquerque. So down the road of perdition I go. As I come up to an exit, marked with a flashing light, I stop. I have the yellow flashes; I don’t need to stop. Fortunately there is no traffic behind me. I am pretty sure this was the next target destination according to the GPS before it died. It’s final words so to speak. Rosebud. Or I-86/Rte. 17. Something like that. I look at my mom. She looks around. This is quite an ordeal, because of arthritis in her neck. So this is how it went. Every intersection, I had to come to a stop and ask if we were supposed to turn here or not. At one point, we come to an intersection with only three roads. You can go straight or right. There isn’t a road to the left. There is someone’s house. I’m sure they don’t want me to drive through their lawn. “You mean right?” I am so optimistic she will correct herself. I also thought Penn State would win. I point out that I can’t turn left. She looks. Another ordeal. It looks painful. We did eventually make it to my sister’s house. God only knows how this was accomplished. But score a victory for the Geriatric Pointing System.